This is a sneak preview of Rifts® Dimension Book™ 14: Thundercloud Galaxy™. This sneak preview includes the front cover, the two Contents pages, a section called "The Thundercloud Enigma," and the Trensik race. 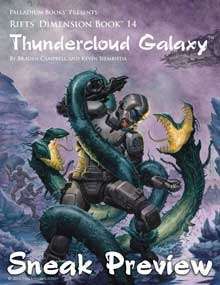 Thundercloud Galaxy™ will be available from Palladium Books on April 26, 2011. For more information, visit www.palladiumbooks.com. This title was added to our catalog on April 12, 2011.